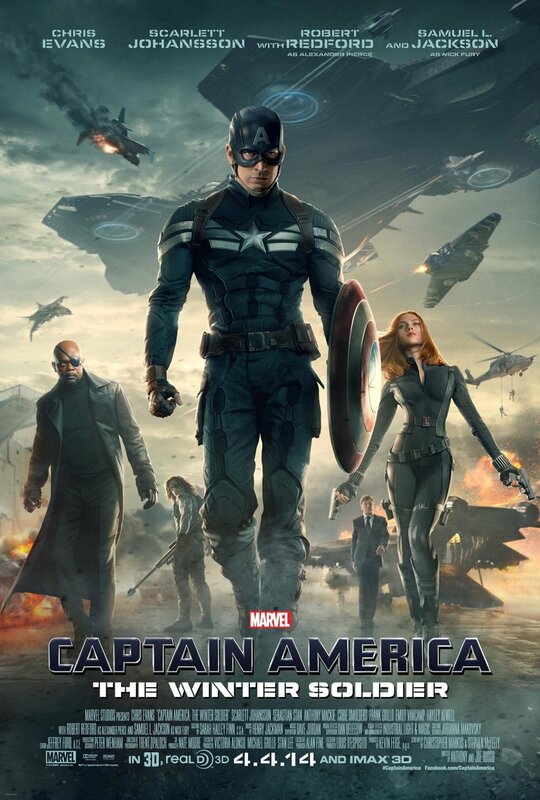 The year that Captain America: The Winter Soldier was released, it was arguably the least hyped or anticipated comic book movie of the year and it had some stiff competition. My girlfriend told me going into the theater that it would be the best comic book movie of the year. I was more than skeptical. She was right. Incredibly so. She’s STILL right to this day. Captain America: The Winter Soldier is the class of the Marvel Cinematic Universe. I’ve seen it dozens of times after that initial viewing in IMAX and I am still impressed with the script, the acting, the pacing, the plot, the fight choreography, the VFX and Henry Jackman’s impressive orchestral score. It is seriously the gem of the MCU and one of the best comic book films ever made. Alright, what’s so damned impressive about this movie specifically? It starts with the plot itself, which is a true spy thriller that is relevant not only to present day thinking but also to Steve Rogers’ character at this point in the franchise. He was a company man and a good soldier in World War II and after he got frozen and woke up in the 21st Century, he tried to be the same way but got caught up in Nick Fury’s SHIELD politics and compartmentalization, first realized when he discovered Fury’s secret plan to use the Tesseract to make HYDRA-like weapons in The Avengers. That started Rogers on a path of mistrust for Fury and SHIELD. So, finding out that he wasn’t told about a secret mission that Black Widow was on during one of his missions to rescue hostages doesn’t help inspire any more trust for Rogers, and the wedge is only further driven home when he’s told about Project Insight, the helicarriers that will patrol the Earth from the sky and keep guns pointed at potential threats before they happen. In Rogers’ words, “This isn’t freedom, it’s fear.” He couldn’t be more right here, but naturally Fury doesn’t see it that way. But Fury’s secret mission for Black Widow to retrieve intel raises his paranoia level about the project, one that goes into overdrive when a brutal attempt is made on his life after he request the project be delayed. Barely escaping with his life, he contacts Rogers to warn him and is still “killed” in the process, but now Steve knows something is horribly wrong. That “horribly wrong” is Dr. Zola from Captain America: The First Avenger, who after Rogers was frozen apparently joined SHIELD and spent decades secretly filling SHIELD with the ranks of HYDRA, infiltrating the organization and influencing world politics over the course of time, until now when Project Insight is ready to roll and HYDRA is readying to use it as their big reveal to the world by holding it hostage and killing millions of people at a time that are deemed threats to them. That’s just the main plot. The subplot concerns HYDRA’s chief assassin, The Winter Soldier, who we learn is none other than James Buchanan Barnes, Rogers’ old friend that he believed dead after falling from a train, but apparently Zola’s early experiments on him allowed him to survive and he was put on ice as well, only to be programmed as an efficient instrument of death with a metal arm. So not only has HYDRA infiltrated SHIELD, they have also turned Captain America’s best friend into a killing machine. So, it's up to the Captain, with the help of Cobie Smulders' Maria Hill, Black Widow, Anthony Mackie's Sam Wilson AKA Falcon, and a presumed dead but very much alive Nick Fury to take down HYDRA and effectively destroy SHIELD in the process to save the world from impending doom. This all sounds like it should be a completely insane, high octane action movie filled with cheesy one-liners and stunts clearly happening in front of a green screen, but the beauty of the movie is that the Russo Brothers masterfully craft this tale with great precision and timing so that everything is balanced properly. We get the big action pieces that are well shot and expertly choreographed, but we also get the great moments of decompression that move along the story itself instead of simply slow things down. This movie has some great moments of dialogue between Rogers and Anthony Mackie’s Sam Wilson, Black Widow, Fury and just in general that really speak to the notion of high concept, at least within the dialogue and the story. Captain America: The Winter Soldier doesn’t sound like a lazily written movie with paint by numbers acting and performances. It sounds like a well-crafted script, expertly shot and strongly acted by its cast. The humor in this movie never once derails the seriousness of the story, not a single part of this movie drags in any place and Henry Jackman’s score is brilliantly patriotic and triumphant at the same time. Seriously, I have too many great things to say about this movie. I love how it’s still a true sequel to Captain America: The First Avenger because of several thread that harken back to that movie, including Camp Lehigh where Rogers first trained, Zola, Bucky and Peggy Carter herself played by Hayley Atwell. I love the Smithsonian scene too, where he’s walking through his own exhibit trying to hide while the little kid sees him, and his jaw drops to the floor. I love the “On your left” opening to the movie and I love how organic every scene flows to the next without anything particularly jarring between transitions. It’s just a well-executed, brilliantly made comic book film from start to finish. Sadly, it represents the end of the “Front 9” of the MCU movies as the next one right after it would signify a change in the franchise overall tone and story beats. This is the halfway point of the whole franchise to now and halfway through Phase 2, and there will still be some more serious toned movies in the MCU without question, but the next film definitely displayed “The Tonal Turn” that would change the course of the franchise forever.